In a Nutshell: Paying off credit cards can improve credit scores substantially as outstanding debt is the second most heavily-weighted factor in calculating scores. We examine factors that determine credit scores and evaluate two case studies where loan seekers paid off credit debt to improve scores. If negative marks on your credit report are the cause of your low score, it is advised to find a credit repair service to help remove them. A survey conducted by the Consumer Federation of America found that a startling number of Americans know little about credit scores, including more than a quarter of respondents not knowing ways to raise or maintain their scores. There are many ways to improve credit scores and paying off revolving debts is one of them. Credit cards and other outstanding debts is the second most important factor considered when determining your FICO score – the most widely used credit score by lenders. Therefore by reducing the amount you owe your score will increase, but by how much is determined by other factors. One quick way to raise your score is to hire a credit repair company that can remove negative marks on your credit reports that lower your score. Lexington Law is our top recommended credit repair service. Lexington Law’s past clients have seen an average of 10.2 negative items removed from their credit reports within four months. Because each individual’s credit report is unique and there are many factors that determine one’s score other than credit card debt, there’s no set amount of points your score will improve from doing any one action that applies to everyone. Someone who pays off $1,000 on a card with a $5,000 limit isn’t going to see the same score hike that someone paying off a maxed out card will. This is because of your credit to debt ratio. The generalized rule is for every open account you have, you want your credit utilization to be below 30 percent. Always keep your credit utilization below 30 percent. Example: If you have a card with a $1,000 limit, you never want to have more than $300 charged on it. The manner in which you pay your credit card debt also contributes to the rate at which your score improves. For instance, if you stop using the card and continue to pay it down month after month until it is eventually at a $0 balance or at least below 30 percent utilization, your score will very gradually increase by a few points here and there, assuming all of your other credit accounts are in good standing. If you pay the balance in full, you’ll notice a moderate point increase much sooner. The best way to see what actions can improve a score and by how much is to use a credit analyzer tool. A credit analyzer can tell you how to improve your score based on the amount of cash you have on hand to pay your debts, as well as how much of a point increase to expect per action. Alas, most credit analyzer tools aren’t free, but Credit Karma has a Credit Score Simulator that uses the information on your TransUnion credit report to estimate the result of changes to an account. We looked at two case studies provided by Mid Oregon Lending to see just how much a credit score could improve by paying off credit card debt. Mr. & Mrs. Doe were in the market for a new home and needed a mortgage lender in the month of October. Their credit score was 678, but to receive the best rates a 740 and above is needed. Without a better credit score, the mortgage would cost them an additional $4500 on a $200,000 loan amount. The reason paying down Credit Card 1 had a much higher score impact for the Does was because they were using 119.8 percent of their limit, beyond maxed out. When all was said and done, the Doe’s decided to pay Credit Card 1 in full, and their score was raised to a 720 by December. The Doe’s did not receive the full credit score impact because of other accounts on their credit reports, including running up more debt on Credit Card 2. By raising their score from 678 to 720, they saved $5,000 on a $250,000 mortgage loan. In July, a borrower requesting a $200,000 loan had steady income and his 20 percent down payment ready. His student loans were paid off and he had no derogatory marks on his credit report. But when his credit was run, his score was 698. 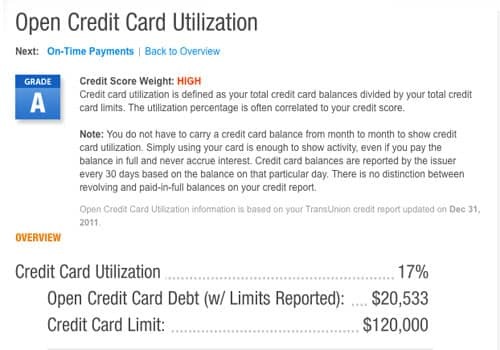 The same credit analyzer tool was used and determined he could potentially increase his score by 102 points. The borrower paid off his card in full. When his credit was re-run in August, his score was 779, up 81 points. The case study states that the borrower likely didn’t receive the full credit score impact because of a lack of reported balances on credit accounts. By raising his score from 698 to 779, he saved $3,000 on a $200,000 mortgage loan. By now you know that paying your credit card debt will improve your credit score, but what else makes up your FICO score? 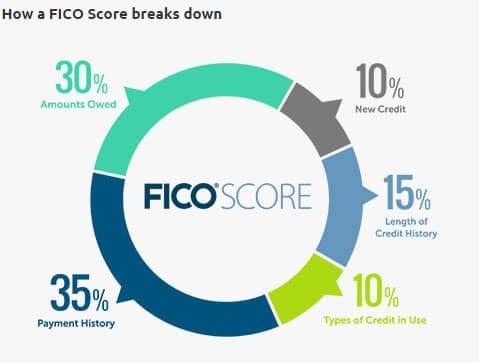 These percentages are used to calculate FICO scores, the credit score used by 90% of lenders. Payment history is the largest factor used in determining your FICO score. This includes on-time payments, so if you’re trying to improve your score, whatever you do, don’t let a payment run late or be missed. What this means is how long your accounts have been opened. Generally, a longer established credit history results in a better score, assuming the accounts are in good standing. FICO looks at the age of your newest account, oldest account, and the average age of all of your accounts combined. What types of credit do you have? A mortgage, student loans, credit card debt, medical bills, retail accounts…all of these are considered. By boosting your score you’ll receive lower interest rates and increase your chances of approval for all types of loans and credit decisions. Your credit report information is updated frequently, so when you begin making positive changes it won’t take very long to notice improvements if you’re consistent. Other than paying down your credit card debt, there are other actions you can take. Consistently pay bills on time every month. Do not max out, or even coming close to maxing out, credit cards or other revolving credit accounts. Pay down debt rather than just moving it around, as well as not opening many new accounts rapidly. Regularly check credit reports to make sure they are error-free. View our Credit Report Comparison Chart to see where to get your credit reports and scores.